The Internet and the World Wide Web (www). An Exchange Rate is 'the rate at which one nation's currency can be exchanged for that of another.' This is mainly determined by the supply and demand for the currency. What creates a demand for a currency? Currency is needed to fund foreign trade or to pay for investments overseas. If Australian customers want to buy goods or services from Japan, they will need to buy Yen first. This will increase the demand for Yen. What influences the supply of a currency? Those wanting to buy products from, or invest in, another country will need to buy the currency of that country in order to do this. For example, if US residents want to buy German goods, they will need to buy Euros with their dollars to find the purchase. This will increase the supply of dollars on the foreign exchange markets. Both demand and supply of currencies may be influenced by Speculation. Speculators buy currencies whose value they expect to increase and sell currencies whose value they expect to decrease. Speculation can have significant effects on the value of a currency. In September 1992, George Soros a Hungarian-American currency speculator, sold US$10 billion of British pounds in a bet against the success of Bank of England's effort to maintain the pound's value. In doing so, he was credited with a major role in forcing a devaluation of the pound that contributed to breaking up the system of fixed exchange rates that governments were trying to put into place in the European Union. Soros earned an estimated US$ 1.1 billion in the process. What determines an exchange rate? Monetary Policy (Interest rates): Capital can flow freely and quickly between countries chasing the highest relative interest rate. To invest in a US bank, a foreigner will have to buy dollars increasing the demand and the value of the dollar. Political factors and stabilities of economies. Economic Growth: Countries experiencing prolonged recession will find exchange rates weaken. Countries with strong 'export led growth e.g. China and Asia will see their currencies rise - unless they try to maintain lower rates by interfering in the market by selling currency reserves to increase supply. The USA accuses China of this practice causing the major US balance of payments deficit with China. International Trade: The desire of overseas customers to buy a country's goods (and services (exports) or the desire of domestic customers to buy foreign goods and services (imports). Speculation: Investors buy and sell currencies if they believe they are about to rise or fall in value. A floating exchange rate system is where the external value of the currency is allowed to find its own value against other currencies without government interference. 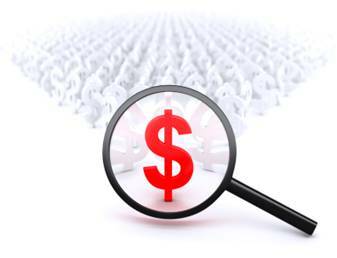 The value will be determined by supply and demand in the foreign exchange market (forex market). A downward adjustment of a currency in a floating exchange rate system is called a depreciation of the currency. An upward adjustment is called an appreciation of the currency. When the exchange rate changes, this also leads to a change in the level of export and import prices. Depreciation in the exchange rate - export prices fall, import prices rise. If you have problem remembering this then simply try a simple example in your head. For example, if the exchange rate between UK sterling and the US dollar is £1=$2, then a £5 export from the UK will sell in the US for $10. If the exchange rate falls to £1=$1 then the export price falls to $5 (though the firm still gets £5). So, depreciation in exchange rate = decrease in export prices. All the rest follows from there. Inevitably changes in the value of a currency will lead to changes in demand patterns for imports and exports and to the value of any surplus or deficit on the Balance of Payments. What happens when export prices rise? Much will depend on the price elasticity of demand for the exported product. If it's inelastic then sales may not drop significantly, whilst if it's price elastic sales will fall and serious decisions will have to be made about pricing policy. Exporting firms may take the decision to lower prices and accept a lower profit margin. What happens if import prices fall? This might reduce national prices (i.e. lower inflation), especially if the imports are components of other products (in which case costs have fallen). However, if imports become cheaper, then local equivalents might struggle - especially if price is important in consumer's decisions. Always remember that goods need to be competitive both on price and non-price factors. The European Central Bank (ECB) has data on trends in exchange rates between currencies for a range of currencies and a range of time periods. 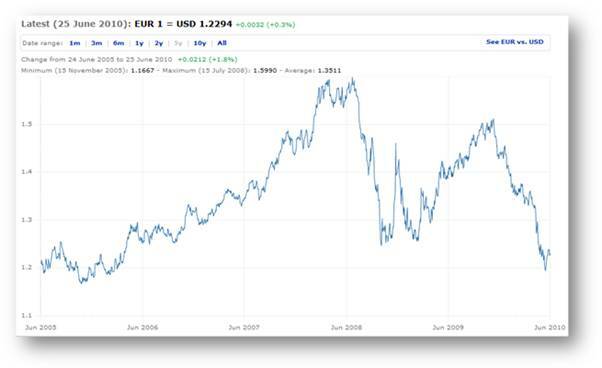 The economic uncertainties in the USA and Euro area between 2007 and 2010 led to some significant fluctuations in exchange rate between the Euro and the US dollar over that period. Business often attempt to minimise the effects of exchange rate increases by buying a range of currencies (hedging) or dealing in options, where the firm enters into an agreement to buy products in the future, but at today's prices. What is the impact of exchange rate fluctuations on firms, especially those involved in exporting and importing?